To keep things easy, we assume that you have already calculated the staffing requirements per time interval with the help of an Erlang C calculator. 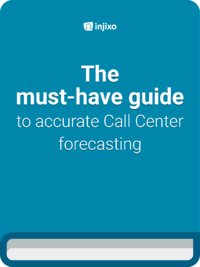 Now it's time to forecast the available staff in your contact center. The forecast of the available staff is important, because once you know how many staff you have available, you can take steps to align the available staff with the staffing requirements. You will get an accurate picture of existing staffing gaps that you can close with the help of different staffing techniques (which we will discuss in the 3rd blogpost of this series). Let’s start with the top 3 mistakes many planners make when forecasting the available staff in their contact center. Headcount reconciliation should be done at least monthly, if not weekly. Understanding exactly how many people you have gives you a baseline to work with. For scheduling, you should really reconcile weekly, but as we focus on forecasting, monthly headcount reconciliation will give you what you need to identify the gaps for your hiring and training plans. Attrition is really challenging to forecast in small organizations. If you have 50 people in a staff group, and project 1% attrition per month, that’s a half person. Do you reduce the count of available staff by 1 person or 0? Neither is technically correct, and may impact whether you’re overstaffed or understaffed. 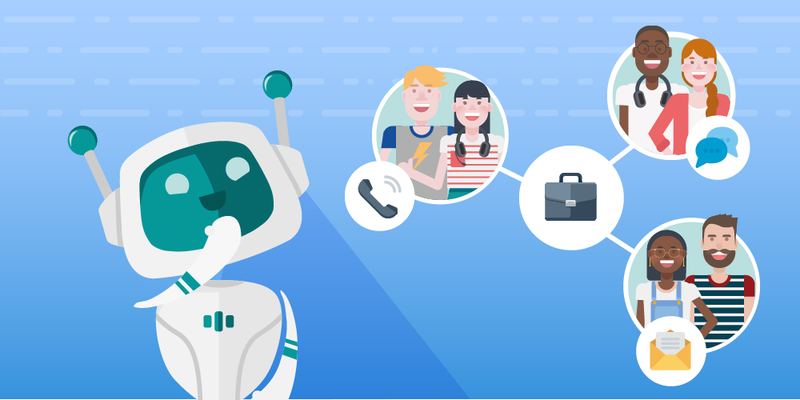 Depending on whether your contact center focuses more on customer satisfaction or on cost reduction, you should expect 49 or 50 available agents. You should also keep in mind that you have both voluntary attrition (initiated by agents) and involuntary attrition (initiated by the contact center). In contact centers, you have groups of calls and you have groups of agents. Usually, you have a group of calls that go to a primary group of agents. But often some of the calls are also forwarded to other teams in the case of an emergency (overflow), so that agents who normally receive service calls now also receive calls from the complaint hotline. It also happens that entire agent groups are temporarily responsible for a different call type. If complicated overflow rules are used in your contact center or entire agent groups temporarily take over other call types, it is easy to lose sight of which agents belong to which group. It is important to note that workload and staffing requirements are typically forecasted for specific call types. Therefore, it is important to also group agents by the call types they typically receive. Now, let’s explore how to do a forecast of the available staff. 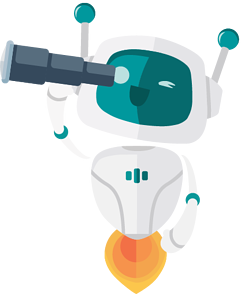 Discover the brand-new injixo Forecast: Fully-automatic and always up-to-date. 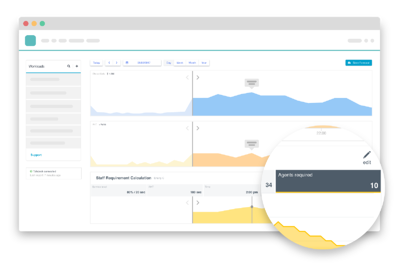 Automated contact center forecasting for calls, chat, email and more. The first step is to determine how many employees - measured in FTE (Full Time Equivalents) - you currently have. In this blog post I define one FTE as 40 hours per week. However, depending on the location and type of company, an FTE can also include more or less hours. In many contact centers, everyone works full time. In this case, it's not necessary to count part-time employees separately. However, if you have employees who work less than 40 hours, you must take this into account. The staffing requirements we determined at the beginning of the blog post (based on workload and service level) are counted in FTE. Therefore, the calculation of the available staff which we are currently performing should also be based on FTE. By that, we are able to better compare them later. There are a few ways to factor in part time workers. This is the simplest method and works best if you only have a small percentage of part timers or if you don’t have the bandwidth to keep track of the actual working hours of your part time workers. This is the more accurate method and pretty straightforward to calculate. Just take the number of hours they work and divide it by the number of hours that make up an FTE in your contact center. If a person works 24 hours and your FTE is 40 hours, then the math is 24 divided by 40, which is 60%. So this person would be in your staffing model as 0.6 of an FTE. Many capacity plans only track 'attrition' in general. However, this mixes two very different motives for leaving the company: voluntary attrition initiated by agents and involuntary attrition initiated by the contact center. If you record these separately, you can much better consider the various reasons for attrition and thus more accurately predict the staff that will be available in the future. Voluntary attrition occurs when an agent leaves the company voluntarily. When you plan voluntary attrition, you’ll look at historical data to see what the trends are telling you. Much like with forecasting volume, you can look at how the rate has changed year over year and also analyze seasonal changes. You may notice that attrition goes up after people get end of year or quarterly bonuses. You may also notice a change in voluntary attrition based on the tenure of the population. New hires (less than a year) generally have a higher attrition rate than employees who have been with the company longer. So you’ll want to determine the attrition rate for new hires as well as tenured employees separately. A good way to build the model is to look back at the last several years (I like 36 months, based on experience, but it varies by industry and depending on how stable the attrition rates of your business are). The calculation works as follows: Determine the average attrition rate for the first employee group for January by looking at the January data for 2016, 2017 and 2018. Perform the same calculation for each month of the year. Then repeat everything for the second employee group. In order to then calculate the attrition rate for all employees, the attrition rates of both groups are weighted according to the percentage size of the respective group. Let's take a look at an example. Step 1: Calculate the average attrition rates for January for the two employee groups. Step 2: Determine the weighted average for all employees for January. Repeat this process for each month. It’s a simple process that you can easily build in Excel with some formulas and then copy/paste for the remaining months. Involuntary attrition takes place when employees are terminated by the company, usually for violating policy or because they don't meet the requirements of the performance management processes. The violation of policies and poor performance are two different reasons for the dismissal of agents. 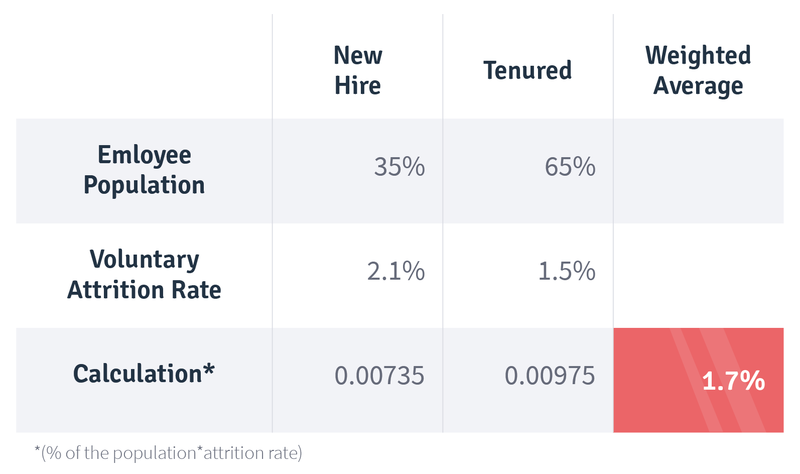 To calculate future attrition rates correctly, both reasons must be considered separately. For example, guidelines may be changed in the future or quality standards may rise. You should be able to determine the impact of both changes separately. On top of that, the attrition rate is also affected by whether or not your company actually enforces the new policies. An example: Let’s say your company has had an absenteeism policy where if an agent calls out unplanned 3 times in a month, they are terminated. Then they change it in a way that now already 2 unplanned absences result in termination. Your historical data is based on the old policy. In the future, there will be a new policy that is more aggressive. You might now expect that the number of terminations and with that the involuntary attrition rate will go up . But that doesn't necessary need to be the case if the policy is not enforced. This is where you really need to understand why the policy is in place (or in this case, changed), and how the management of the operations team plans to enforce it. In this example, if the objective of the contact center is to only send a message, but not to actually terminate more people, your attrition rate won't change. So as you can see, the work to determine involuntary attrition can be complicated, and requires a lot of engagement with your partners in operations. It also requires interpretation. But the payoff is huge in terms of getting to the right number of staff. Are you informed when an employee moves from one team to another? Does management tell you when a change is upcoming? Are all changes entered directly into your WFM tool? The answer to all these questions should be "Yes". It is very important for planning that you are informed when a team is suddenly responsible for a new call type or an employee changes from full-time to part-time. You should also be informed of all new hires, transfers and terminations. Much of this information can be obtained directly from the HR system. It is crucial to define a clear process for when you want to be informed by whom about what. Forecasting the available staff in your contact center is key to a well-built staff plan and often doesn’t get the focus it deserves. Take the time to really build this out. That's why you should measure your historical accuracy and keep it in mind as you’re making decisions. If your forecast accuracy for the available staff is +/- 1%, you can build important business decisions on it. >> Also read: 5 Mistakes That Might Cost Your Contact Center Forecast Accuracy. The third and last blog post in this series offers best practices to close the gaps between staffing requirements and available staff. We'll cover proven techniques for effectively aligning staff to demand both short and long term for the next few weeks up to several months.